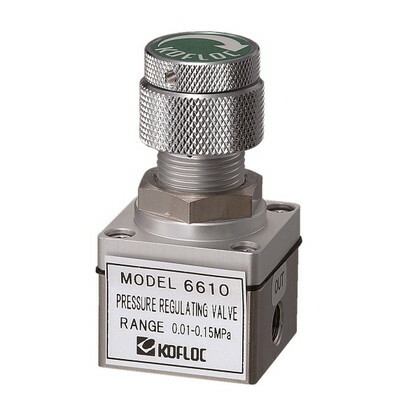 of the low-pressure side compared with the Model 6600. High regulation performance with repeatability of ±1% or less when the pressure on the primary side and load resistance on the secondary side change under the set pressure condition of 0.01–0.15 MPa. The sections in contact with gas are made of stainless steel, Viton, and Teflon without using grease. This valve is ideal for the semiconductor industry which requires ultra-clean conditions. The regulating position, once it has been set, can be fixed by a lock nut to prevent the setting from changing. This non-bleed type valve prevents gas from leaking to the outside.